Verizon has taken a step away from the Yahoo security saga of the last year, after renaming its newly formed AOL-Yahoo media business Oath. We’re not 100% sure where to start with this one… however we are sure the marketing execs at Verizon sweated for days and weeks over this decision, and the ambition is to probably inspire an image of loyalty, trust and servitude, but we just think it sounds naff. 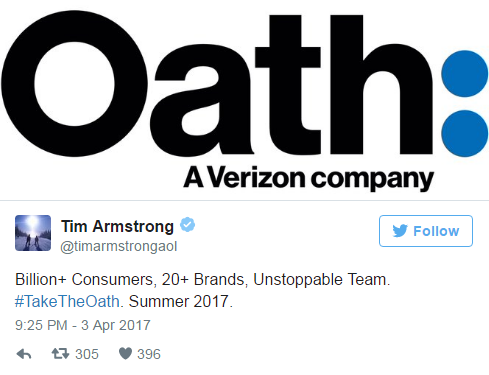 Announcing the rebrand via twitter, AOL CEO Tim Armstrong also included a new hashtag which will presumably be one of the brand slogans; #TakeTheOath. It takes cringe to a new level, but we imagine there has been a lot of back slapping going on at Verizon HQ. What this tagline actually means is unknown for the moment, but perhaps the oath will embody the faith consumers will have to put into the business to believe it won’t get hacked again. The new Oath business will be made up of more than 20 media brand, with AOL bringing Huffington Post, Engadget, MovieFone, MapQuest and TechCrunch, as well as a number of other smaller sites, while Yahoo contributes Tumblr, Flickr, and video advertising business BrightRoll. Amusingly, the Yahoo media business made it very clear that it wasn’t going to go anywhere near the branding horror-show, remaining with the tried and trusted (albeit as secure as state secrets in Hillary Clinton’s personal email) brand. “Yahoo, the media brand so many consumers know, that includes Yahoo Finance, Yahoo Sports, Yahoo News, and other verticals, is not going away,” the team states in one story. “As for why Verizon chose the name Oath (rather than simply calling the media division something like, say, Verizon Media), the company is not commenting.” A very valid point from the Yahoo media team. What remains to be seen is how loyal those Yahoo customers actually are. The team previously claimed to have more than one billion customers, a number which still shocks the world today, though how many of these are active users which would ultimately be of use to the Verizon advertising business is unknown. Is 'superfast' enough to pry an extra tenner from our wallets for 5G?